Studies have indicated that children learn best in an environment where they feel supported and engaged. The first anniversary of banning corporal punishment in all educational institutions in Bangladesh still bring with it tales of classroom horrors. From beating, chaining to inducing a student to commit suicide, the evidences are aplenty. But one does not need to be pessimistic -if the decree is new it will require time to graduate into the mainstream. Advocates of school corporal punishment argue that it provides an immediate response to indiscipline and that the student is quickly back in the classroom learning, rather than being suspended from school. But the truth remains that the use of physical punishment in schools to discipline children was a more or less accepted practice in the past. Shayak Ahmed who is a senior teacher at an English Medium school says, "For us it was not a big deal; in fact, it was very common to be punished by teachers for our mischief". In recent times, it has lost its context, because the environment and the psychosocial conditions under which a modern-day child grows up have undergone a huge change. As a result, after such kind of punishment, children react in a way that is quite different from their predecessors. It is not only that the victim may suffer physical injury. It has also been observed that students abused at school become violent and often mentally disturbed. In extreme cases, they demonstrate suicidal tendencies or even worse, they become revengeful on their teachers. These are dangerous trends and are harmful for the physical and mental development of the future generations. The consequences could even prove fatal as was the case in 2005 of 13-year-old Dipu who, after having missed the roll call in class, had approached the teacher to take down his attendance. He was beaten so severely and frightened so badly that he contracted a fever from which he never recovered. While only some of the worst cases make the news, hundreds of others occur every day throughout the country. A study by United Nation's Children's Emergency Fund indicates that beyond the immediate and tangible wounds of abusive incidents by teachers on students are the long-term psychological impacts that obstruct the education and development of a child, even those who are mere observers of the abuse. Repeated studies have indicated that children learn best in an environment where they feel supported and engaged, but corporal punishment has been shown to generate feelings of humiliation, anxiety, and worthlessness. Corporal punishment has been shown to generate feelings of humiliation, anxiety, and worthlessness. Similarly, while school is intended to develop the child into a model citizen and a productive member of society, corporal punishment has been shown to increase a child's vulnerability to depression, addiction to drugs, and violence. It also inhibits the development of independent and creative thought. In August 2010, under the orders of the High Court, the Bangladesh Government banned corporal punishment in institutions all over the country. Corporal punishment is unlawful in schools according to a Supreme Court judgment issued on January 13, 2011 which stated that it violated the Constitutional prohibition of torture and cruel, inhuman or degrading punishment or treatment. The judgment followed a writ petition filed in July 2010 by Bangladesh Legal Aid and Services Trust and Ain o Salish Kendra with the High Court in Dhaka, it constitutes misconduct and that measures will be taken against perpetrators under the Penal Code, the Children Act and through departmental action of the Ministry of Education Circular August 2010 regarding the Ending of Corporal Punishment on Students in Educational Institutions. The Ministry developed Guidelines on the prohibition which came into effect in April 2011. Prohibition is yet to be confirmed in legislation; the Supreme Court has ordered laws relating to disciplinary action against teachers to be amended to identify the imposition of corporal punishment as misconduct. Brigadier General Mohd Golam Hossain Sarkar, Principal of Rajuk Uttara Model College says, "Punishment is to a certain extent necessary for children but it should only be a punishment that evokes discipline in the student, not to harm the student physically or psychologically." He goes on to mention that the school is very strict about discipline at the assembly and in the classroom. Students are warned against extra classes or sometimes made to run a few laps around the school premises if they do not maintain discipline. "Sometimes we need to appreciate that parents often pressurise their children a lot because they want them to excel in the competitive environment that exists. This also results in an extra restlessness in them and that is when they become hard to handle and punishment is required to keep them in control. So parents should also try to be easy on their children, especially those of grade VI and VII. It is very difficult to explain to them that once the children are promoted to grade-VIII we will be drilling them to prepare for their Junior Secondary Certificate (JSC) exams so parents need not to worry so much. Therefore, always putting the blame on the educational institution, without holding the parents responsible, is not the solution." Mollah Abdul Kader a teacher of Uttara Model Madrasa, explains that ever since the Government has announced the ban on corporal punishment, they have made sure all their teachers are made aware of it. This also includes briefing the teachers about how they should behave with their students. "Islam does permit disciplining children in order to make them learn and set them right when they do wrong. Since it is the order of our Government we do abide the by the ban." He did not provide any reference as to where it is mentioned or what type of punishment is accepted in Islam. 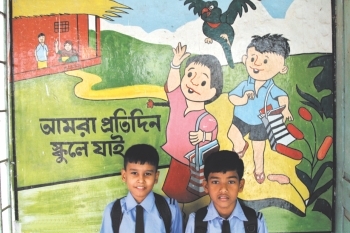 The Education minister, Nurul Islam Nahid has said, "Corporal punishment has already been reduced at many educational institutions after the ban, but for a ban to be effective we should all appreciate that the government alone cannot change everything. We need to all come together to make sure that these things do not happen and not expect it to happen overnight." Implementing the ban on corporal punishment in all educational institutions in Bangladesh is a movement in the right direction. One cannot tolerate beating of students as part of an acceptable means of education. It is a throw back of a bygone era. The fact that government has initiated the process is commendable indeed and one sincerely hopes that in this regard at least the different parties will come together. It is still a work in progress and it is important that awareness about it and swift punishment on those who violate it are carried out.